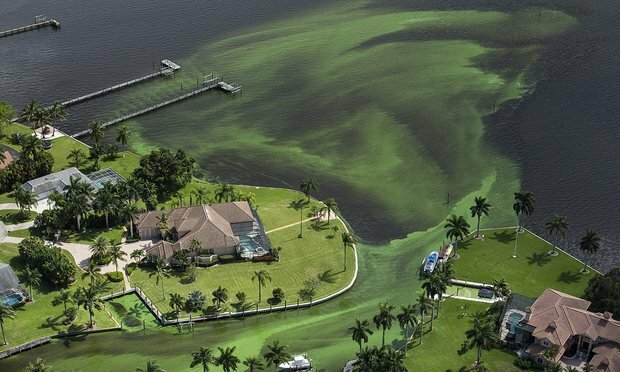 South Florida’s coasts are being choked by smelly, green algae blooms after excess water from Lake Okeechobee was released into the ocean. The lake has been contaminated with unprecedented levels of toxins after the government pumped polluted runoff into it to curb flooding in the area. Residents blame the federal government, state water managers and Florida Gov. Rick Scott for yet another spiraling environmental catastrophe. First sightings of the blooms were reported in June, and since then they’ve been spreading — prompting the state of Florida to declare a state of emergency for Martin and St. Lucie counties on Wednesday, extended to Palm Beach and Lee counties on the western coast on Tuesday. The algae have given south Florida residents rashes and coughs and are consuming all the oxygen in the water, threatening the bio-diverse area. The scale of the blooms makes them look like oil spills on aerial photographs — only greener, and gooier. The blooms have grown to huge proportions. 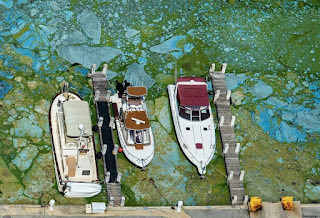 Martin, St. Lucie and Palm Beach counties alone stretch for nearly 100 miles along the Atlantic coast, so how did the algae grow so fast? These counties, along with Lee County are all connected through various rivers, canals or estuaries to the state’s largest body of fresh water, Lake Okeechobee. And this lake seems to be the cause. In the wake of a year with heavy rainfall — enough to cover the city of Delaware in two feet of water — the government was forced to “back-pump” billions of gallons of polluted runoff into the lake to save crops and prevent further flooding. As Lake Okeechobee began to overflow, the U.S. Army Corps of Engineers dumped the excess water into the waterways that connect the lake with the coast to protect the neighbouring towns from life-threatening flooding. 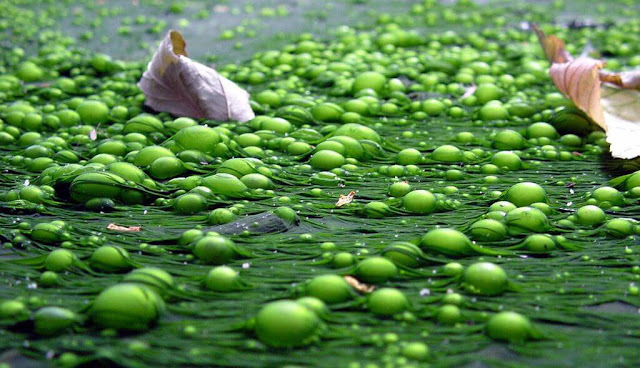 The mineral-rich waters of the lake allowed the algae to bloom uncontrollably, and now the area’s ecosystems are buckling under their weight. In the Executive Order he issued Thursday to declare a state of emergency, governor Rick Scott blamed the federal government for the crisis. The lake is surrounded by the Herbert Hoover Dike, a wall of natural materials like soil, rock and shells, that has fallen into disrepair. It was designed for a water level of 18 feet above sea level but to prevent a breach, the Corps of Engineers tries to maintain the water level between 12.5 and 15.5 feet above sea level, the Washington Post writes. “[Had funding been provided] the Corps would not have been required to discharge approximately 30 billion gallons of flood waters from Lake Okeechobee to the St. Lucie and Caloosahatchee Rivers and estuaries,” the governor said in his executive order. But as he has yet to visit the area himself, residents are blaming the governor and his administration for not doing enough to solve the problem. Together with Martin County commissioners, they’ve called on the Corps of Engineers to reduce the flow of water it has been pumping out of Lake Okeechobee, and recently gained support from Florida senators. The Corps announced it would begin a “pulse release” that will reduce output levels. “… After visiting with local elected officials in Martin County yesterday and viewing the algae first hand, we felt compelled to take action, even though we need to remain vigilant in managing the level of Lake Okeechobee,” Col. Jason Kirk, U.S. Army Corps of Engineers Jacksonville District Commander, said in a press release. Following a visit in the area this week, Sen. Nelson said the issue shouldn’t fall just on the shoulders of the federal government. 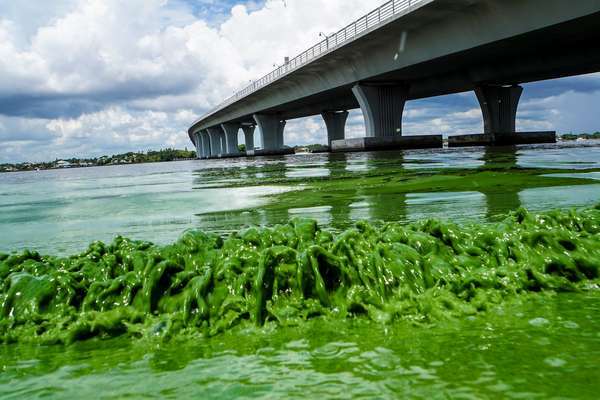 He called on the state legislature to spend money on environmental projects already approved by Florida voters, reported the WP, including the purchase of land surrounding Lake Okeechobee for water storage instead of diverting funds to pay for administrative costs. I would urge everyone to remember that the first priority shouldn’t be to decide who’s at fault for this situation, but figuring out how to go about fixing it. There’s enough time for finger pointing after the ocean stops looking like chunky guacamole.